New York Times and USA Today Bestselling Author L. Wilder brings readers another wild ride in the Satan&apos;s Fury Series. I may look like the boy next door, but if you mess with someone I care about, I&apos;ll become your worst nightmare. I never dreamed that I&apos;d end up at a motorcycle club, especially one as notorious as the Satan&apos;s Fury MC, but that&apos;s exactly where I&apos;d found myself. They were supposed to be vicious, cold-blooded killers, but after an accident that nearly took my life, they opened their doors to me, treating me with nothing but kindness. I should&apos;ve kept my distance, kept my guard up, but Ellie Blackwell had me feeling things I&apos;d never felt before-good things, really good things. There was no way I was gonna walk away from that. It might&apos;ve been a mistake to get wrapped up in her when there were so many unknowns surrounding her past, but in my gut, I knew she was the one. I didn&apos;t care what obstacles stood in my way, I was going to make her mine. The brothers of Satan&apos;s Fury are back with this fast paced, action packed, MC romance. 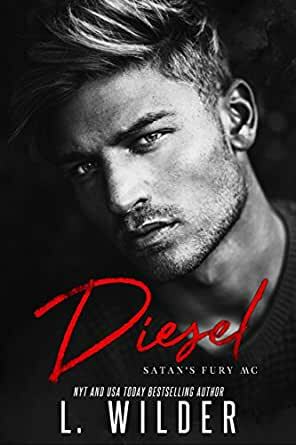 Diesel is book eight of the Satan&apos;s Fury MC series. This full-length standalone novel is intended for mature audiences only due to the explicit language and violence. Reader discretion is advised. From the prequel too book 8, I read cover to cover. I enjoyed the whol series. Now I’m on to the Memphis Charter. 5.0 out of 5 starsAnother Hit for L. Wilder! Diesel had grown up not knowing his father until his mom told him who it was on her deathbed. After her death he went to find him and became a prospect in the MC where his Father was President. His Father died before he told him and the MC was wiped out so he left with his half sister Jo to the Satan’s Fury MC where he Prospected and became a member. Ella was running away from an abusive relationship and wrecked down an embankment in the snow. Ella was hurt badly, but managed to stumble three miles to the MC’s property before passing out. They brought her in and took care of her, but when she woke up she didn’t remember anything. When the brothers saw her in a news story about a missing couple she remembered that was her name, but didn’t remember anything. This story was filled with love, mystery, and redemption. I love L. Wilder’s books and this one did not disappoint! Wow! I think this is L. Wilder's best book to date. It was a bit difficult to get into in the beginning, but once the story really got going i couldn't out it down! Diesel is so completely swoon-worthy! And Ellie has such inner strength that together they were a fantastic couple. As complex at this story was L did a great job at wrapping up all the twists in the storyline by the end of the story. And just to throw it out there I feel that Joseph is deserving of a story of his own. Keep in mind that this book is one in a series and some things may be confusing if you have not read the others in the series. But all of the books in This series are well worth the read. 5.0 out of 5 starsWOW!!! Just WOW!!! WOW!!! Just WOW!!! I loved Diesel!!! From the moment he met Ellie he seemed to know she was important to him and his protective instincts went into overdrive. It didn't matter that no one knew who she was or where she came from. That just gave him more reason to have her back. Ellie has been through more than her fair share of misery. But through it all she seems to hang on to the hope that someday she will get away. Then she does, but she has no idea who she is when she wakes up in the Satan's Fury MC clubhouse. From the moment she wakes up Diesel is there. Quietly taking care of her, supporting her. But when her memory comes back she realizes she can't stay. She can't put these people in jeopardy. This story keep me riveted from the very beginning. And I loved getting to touch base with the other members of the club. L. Wilder just gets better and better, she is one of my favorite authors. Her writing pulls you in, holds your interest till the end and fills your heart with warmth even through all the craziness of these MC men. These men sure do know how to be protective, fight for what’s right and love fiercely. They are a true family, who care for each other and stand up for one another no matter the cost. Makes you want to be apart of this family. This is Diesel and Ellie’s story. Their connection was instantaneous. She was broken and he helped heal her. They had a beautiful relationship and amazing chemistry. Ellie went through so much, it hurt sometimes to read about it. Her story hit close to home for me. I was rooting for her the entire time. She deserves an fantastic man like Diesel. Highly recommend this book and all others in this series! 4.0 out of 5 starsAnother enjoyable addition to the series! Diesel was Satan’s Fury MC’s eighth book by L Wilder. Diesel aka Scotty, was fairly new to the Satan’s Fury. We met him in the previous book, Two Bit, as Zoe’s savior from the Chosen Knights. We learned quickly that Diesel was actually Zoe’s half brother. He was big and strong, but he had a soft spot, loyalty and an alpha protective streak for those he loved. Ellie had a hard adult life. She married the wrong person and lived an abused life. We meet her when she was on the run, had an accident and woke up without her memory. She proved to be strong and fierce, despite her experiences. Wilder took us through a tale while unraveling the pieces of Ellie’s story in order to bring us to the present. It was somewhat suspenseful while each layer was being revealed, but it wasn’t drama filled, turbulent or even violent (other than the past abuse) as many of the MC’s stories have been. In the end, it was a quick read, a reminder of the horrific challenges within an abusive life, and a sweet story for those who find their champions. It wasn’t my favorite of the series, but it was well written and enjoyable, none the less. For the next books in the series, it appears we’ll be heading over to the Memphis charter of the Satan’s Fury. Hopefully new details will be revealed soon.